I often get asked at my Thermomix demonstrations about pizza dough and can you freeze it etc etc. I thought I would write this to show you what we do when we make pizza dough. 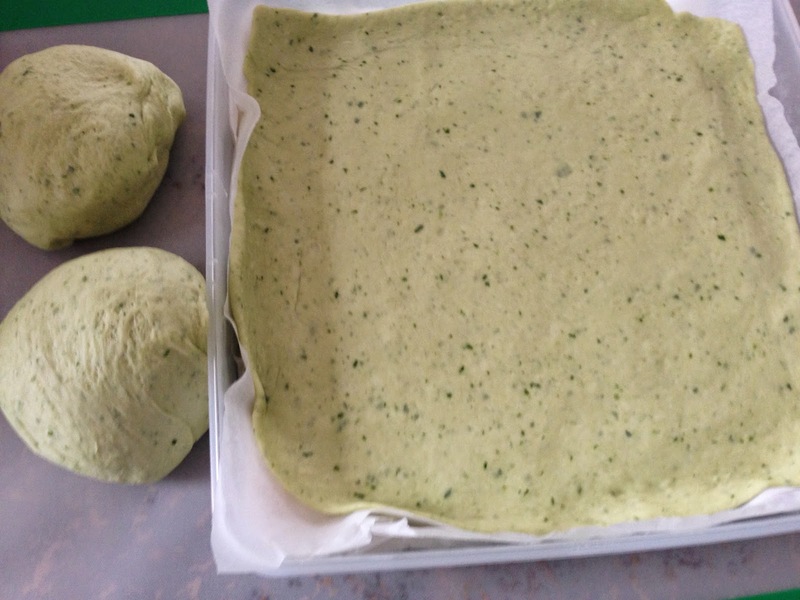 Firstly, make a batch of pizza dough using the EDC method. The only tweaks I make is that I warm the water first on 37C for 2 minutes with the oil and yeast in. 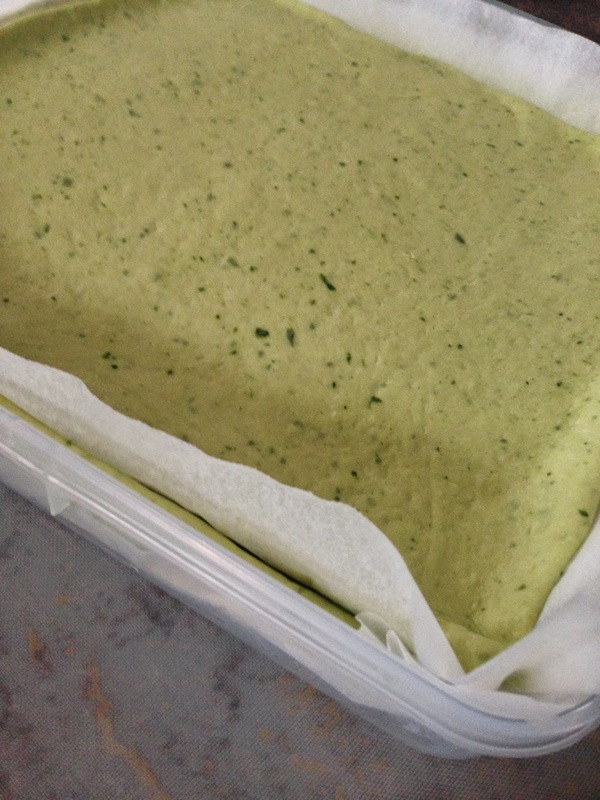 The batch in these photos has 2 large handfuls of baby spinach leaves in it, which I pre-milled on speed 8 for 10 seconds, then continued dough recipe. I just reduce the amount of liquid by 20-30g. I also used leftover whey from making ricotta (see the ricotta technique I use here) in place of water, as I had some on hand. Let the dough rise in your Thermomat for 15-30 minutes. If I want to stretch my dough out to 3 bases I let it rise closer to 30 minutes. Cut the dough into 3 equal sized balls. Cut 3 squares of baking paper the same size as your container. I use a decor brand pastry keeper, I find it is the perfect size for pizza bases, fits my freezer well and I can fit 5 or more bases inside. 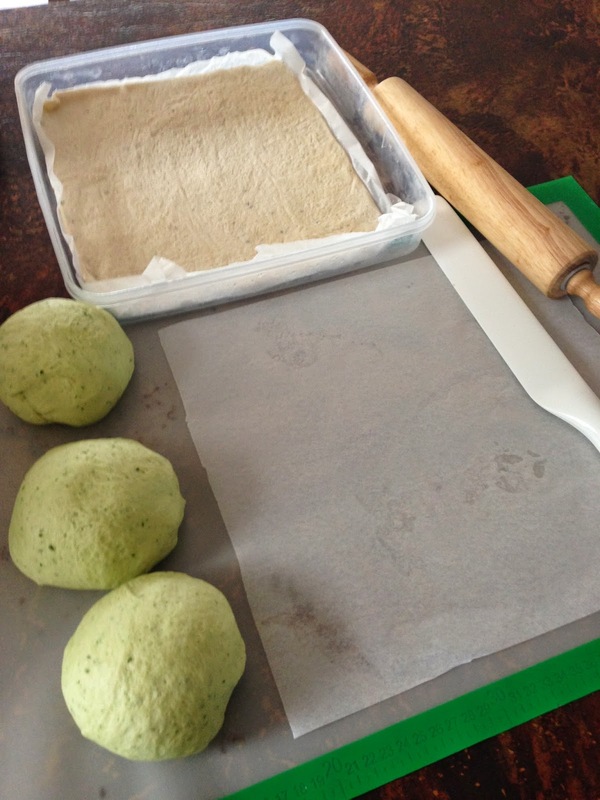 With the baking paper on top of your breadmat, roll or press out by hand into a square shape (or whatever fits your container) and put base into the container with the baking paper attached. Continue with your other bases, layering them on top of each other with paper in between. These freeze well for a month or so...personally I haven't kept them longer but I am sure you could freeze them longer. If you prefer, you can par-bake your bases and freeze them par-baked. This is good if you want a quick meal later, just dress them and cook straight from the freezer. You will get a crispier base if you par-bake them before dressing them. Hope that helps! Leave a comment on my facebook page if you like!